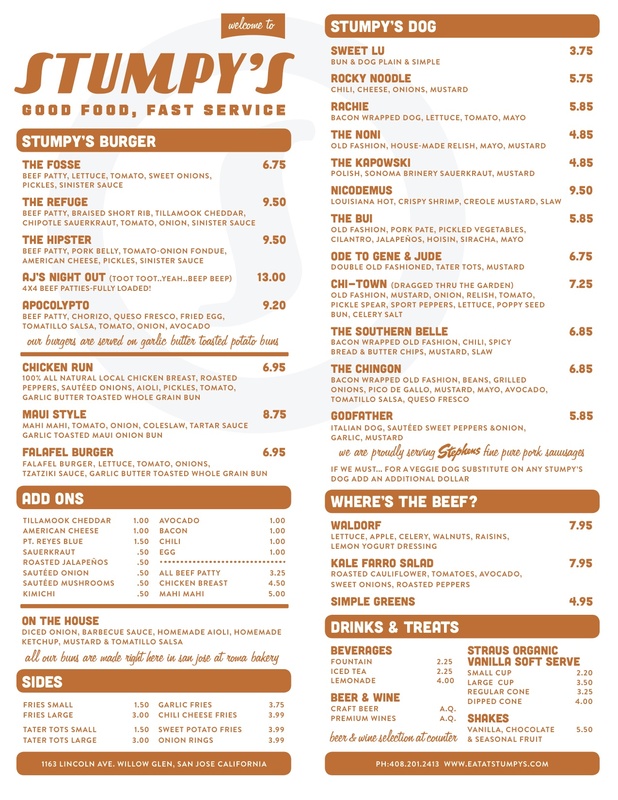 STUMPY’S BURGERS, FRIES AND DOGS SHARES A DEBUT OF ITS MENU, AS THE RESTAURANT AT WILLOW GLEN’S LINCOLN AVENUE PREPARES TO OPEN (POSSIBLY) AS OF THIS WEEKEND. Prices seen on this menu are preliminary and are subject to change. The new restaurant is located at the Garden Theater Building. Jim Stump is still waiting for the outdoor furniture to arrive for the curbside dining, as de·Anza Post had featured earlier. Last heard from the owners of Top Nosh, they too should be expanding their food offerings, with considerations of an expanded menu and extended hours. This entry was posted on Tuesday 15 July 2014 by de·Anza Post in Uncategorized and tagged Curbside Dining, Downtown Willow Glen, Garden Theater Willow Glen, Jim Stump, Lincoln Avenue, Los Gatos Brewing Company, Parklet, Restaurants, Stumpy's, The Table Restaurant, Top Nosh Cafe, Willow Glen.